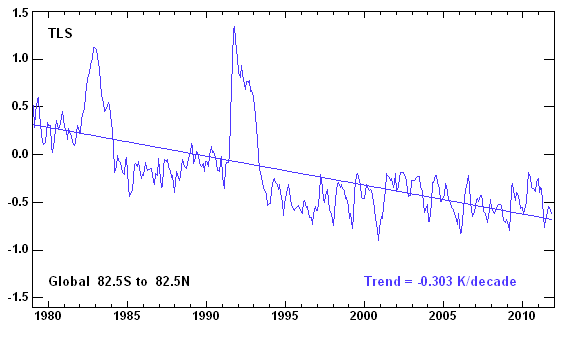 2) Here is a chart showing the Temperature of the Lower Troposphere (TLT) from 1979 to date. From 1979 the modern satellite temperature record first became available. 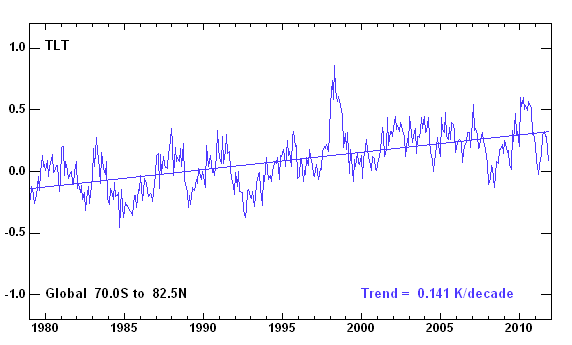 3) Here is a chart showing the Temperature of the Troposphere and Stratosphere (TTS) for the period 1987 to date. 1987 was the year when such information first became available. 4) The only reasonable conclusion to be drawn from the above is that CO2, volcanic outbreaks and El Nino events have little or no effect on the background temperature trends in stratosphere and troposphere because of the ability of the Earth system to change the height of the tropopause and the size and location of the permanent climate zones to change the speed of energy flow through the Earth system and thereby negate any such effects.. 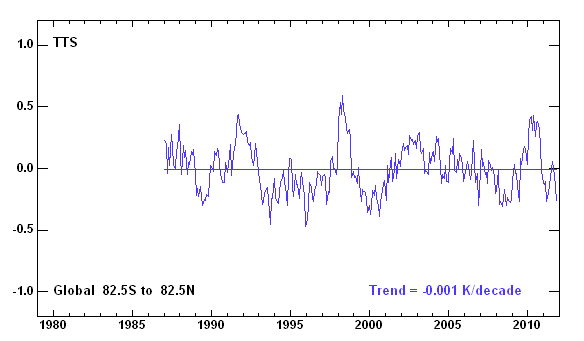 The TTS data shows almost a zero change from 1987 to 2011. We have to look elsewhere for the cause of the change in temperature trend to flat in BOTH stratosphere and troposphere that occurred in the middle and late 1990s. for a description of how the observed opposite temperature trends in stratosphere and troposphere could be achieved without the need to invoke any significant CO2 effect. for a description of how variability in the size and speed of the water cycle and of the positions, sizes and intensities of the permanent climate zones work together to alter the rate of energy flow from surface to space to maintain Earth system stability. ” How The Sun Could Control Earth’s Temperature”. On the other hand TLS shows a strong response to El Nino events but TLT shows no response at all. It might be interesting to detrend the TLT and TLS series and perform a correlation analysis on the short-term variations. My guess is that you would get no correlation, indicating that the tropopause acts as a barrier to heat flow. But I guess we knew that already. I tried to open your link to “How The Sun Could Control Earth’s Temperature” but got an error message. Thought you should know. Now, now, we have to be nice to our very good friend CO2. It’s my bed time now. When commenting about GLOBAL temperature; but taking in consideration ONLY northern hemisphere, is what NASA / IPCC want you to do. Talking about LOWER troposphere, instead of as one troposphere is also cherry picking. It’s prudent to obtain Russian data – they mislead LESS than NASA. Temperature in the stratosphere a] doesn’t fluctuates b] is irrelevant for the temperature on the ground. Those gases helium, aerosols, ozone just spin there, without coming to the ground to bring any coldness. Not the sun or CO2 controls the temperature in the atmosphere, but oxygen and nitrogen. They are 998999ppm, CO2 is 270-400ppm. when the sun radiation increases, affects electronic inhalations, full stop; will be proven soon. When for any reason O+N warm up – they expand up – intercept extra coldness redirect it down and equalize in a jiffy. CO2 intercepts more radiation during the day in upper troposphere.= that heat never comes to the ground. At night CO2 uses the second factor – intercepts more coldness than O+N, reason CO2 is used for making dry ice, instead of O+N. The climatologist used the first factor (disregarded the second factor)and promised Nuclear Winter for year 2000. Before you even defrosted from their Nuclear Winter – they went 180 degrees in opposite direction by using second factor with bigger noise and disregarding the first factor. 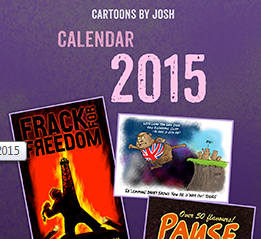 GLOBAL warming is exactly the same as their nuclear winter – only bigger rip-off. When part of the atmosphere cools, for any reason – O+N shrink appropriately = release less heat, or intercept less coldness if you will; until equalizes in few minutes – go back to normal volume. If solar eclipse – the moon intercepts lots of sunlight not to come to the earth. Where is the shadow – the air shrinks – from other areas air comes, to avoid vacuum. By smaller troposphere – intercepts less coldness and temperature stays overall the same at all times! Ice age can only be on one hemisphere – the other is always / simultaneously much warmer than normal. Because, on the hemisphere that is the ice age = air shrinks – from the other hemisphere lots of air goes there = on the other hemisphere less air = hotter days. If theoretically gets colder on both hemispheres than usual – the oxygen + nitrogen shrink INSTANTLY – intercept less coldness, or release less heat, if you will = equalizes in a JIFFY = no ice age. If the laws of physics don’t approve of something = is because is WRONG: http://globalwarmingdenier.wordpress.com . Mitich formula: EH>AE>ECI (Extra Heat >Atmosphere Expands > Extra Coldness Intercepts) sunspots / sun-flares are for naive Skeptics to create back-door exit for the manipulators. Remember my formula, you can’t go wrong. Visit my website, is not much, every text is connected / related to the rest. Scrutinize and see that when something is correct, can be proven ALL now.